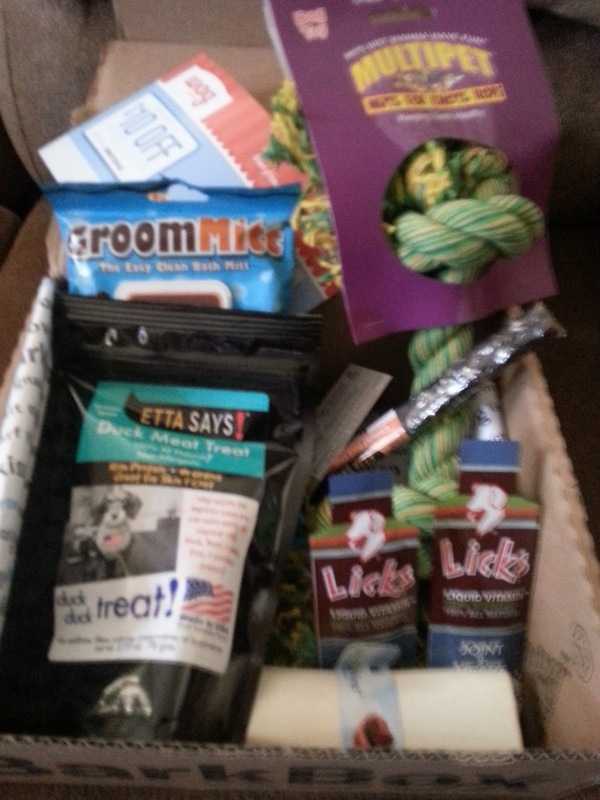 The Bark Box is here! Actually it came a week ago, but I've been so busy with dog club stuff (newsletter, obedience trials, prepping for Star Puppy graduation) that I haven't been blogging. So, want to know what was in the box? First off, there was a Nuts for Knots Rope from Mulitpets. It's big and sturdy and great for tugging. Jedi and I had fun playing with it in the yard. 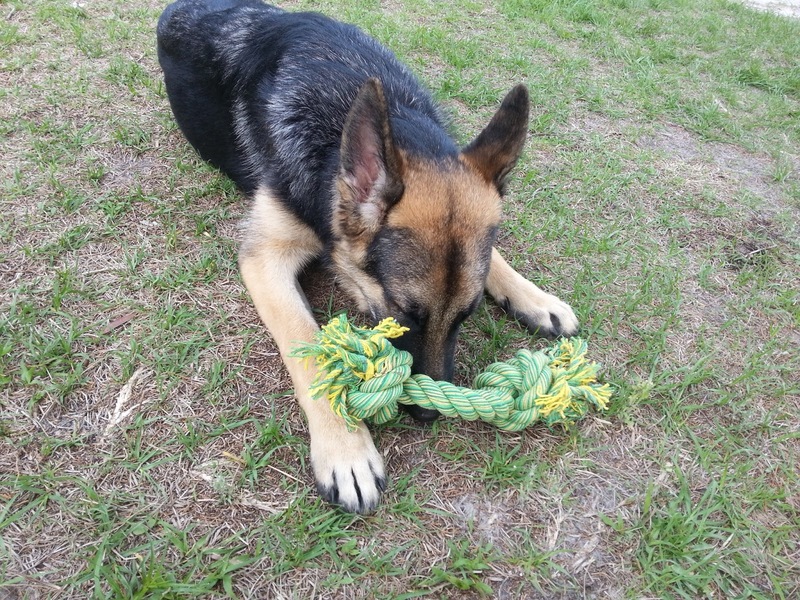 We have other rope toys, but this one is different. This rope is made of hundreds of thin cotton strings, causing the ends to fray in fun way. The rope reminds me of a bird toy. Jedi likes to chew on the fuzzy ends. We also got a pack of Freeze Dried Duck Meat Treats from Etta Says! This is weird. Because it's freeze dried, it's very light and compact. The cubes are the size of dice (that would be the standard d6 for all my nerdy friends) and weigh next to nothing. The consistency reminds me of the Astronaut Ice Cream we use to get at the Smithsonian. The dogs were hesitant to eat it at first, but piggy Jedi got over that quickly. What I like about the product is that it is 100% duck meat (no additives, fillers, coloring or preservatives) and is made in the USA from American Farms. Also from Etta Says! was a 4" Duck Chew. This didn't last long. I saved it for Game of Thrones night, hoping to avoid the previous week's Game of Thrones experience. Jedi sat quietly in his crate for the entire episode. Thank you duck chew! This is a product I would buy again. There was a Stuffed Shin Bone from Barkworthies. I gave it to Jedi, but would only let him chew it lying in my office while I worked on the newsletter. He tried to carry it off into another room a couple times, but once he figured out what I wanted I got almost an hour of computer time. He was content and I got the newsletter finished. I will definitely invest in more stuffed bones! We got two Licks Joint and Heart Liquid Vitamin Drink Supplements. The dogs liked it, though I don't know if I'd buy it on a regular basis. I'm not big on supplements. And last but not least, a pack of Groom Mitts from Aussie Naturals. This is so weird. There are ten disposable mitts in a pop-up pack that reminds me of baby wipes. I haven't used one yet, but I did open the pack to get a sniff. They smell kind of lemony. I'll try them out next week at the Fun Match before we go into the ring. P.S. 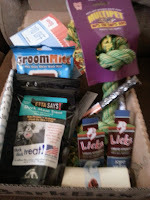 Want your own Bark Box? Click here and get $5 off! Jedi likes his new rope! You all have such fun with these bark boxes. We are just getting something similar over here. Have a super Saturday.